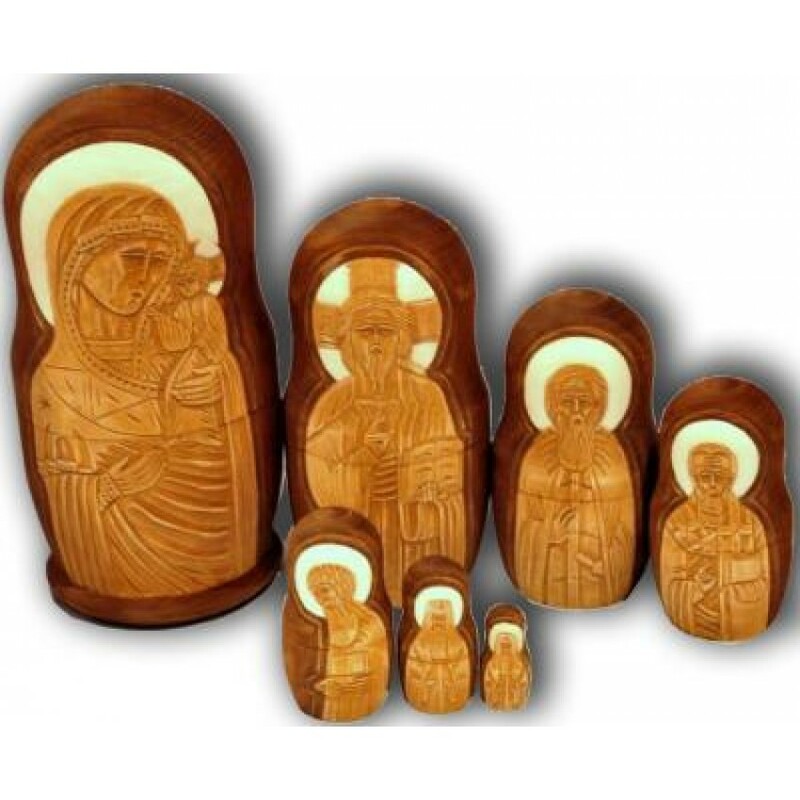 This 7-piece set of Matrushka Dolls, made in Sergiev Posad by famous artist Krassavin, was hand-carved accordingly to all traditions of Russian folk art and icon painting. Here you can see the Virgin Mary, Jesus, St. Nicolas, apostles and saints. Matrushka Dolls are pieces of art that always have profound meaning. Some researchers of Russian art assume Matrushka, a female doll with a number of off-springs to be a prototype of the Virgin Mary – the goddess of life, the goddess of eternal increase of family line. The other scholars believe that 7 pieces of classical Matrushka doll denote that the Man, as the Earth itself, has seven spheres – seven doppelgangers that could be seen by our ancestry. Even the wiser heads mentioned that seven descents save the memory and genetic codes of generation. It is no mere chance that this set of Matrushkas consists of seven pieces. These Matrushka Dolls have minimum decoration and no coloring materials, because the artist didn’t want to draw attention from the most essential – belief in God. So, this exhibit meets the standards of Russian folk art and icon painting and can properly glorify your collection or it can be a perfect gift for Christmas or Easter! Russian toy, dubbed as Matrushka Doll goes down to Sergiev Posad, where it has gained special fame and love. Matrushka Doll has become a “Russian girl”, a symbol of all the Russian for all the citizens of different countries. Matrushka doll’s character, its dress and form was brilliantly and accurately depicted by artists from Sergiev Posad. Matrushka Dolls are made in different regions of Russia today (Moscow, Saint Petersburg, etc. ), but those items, made in Sergiev Posad deserve to be called classical ones. This region was always famous for its toys. Even Sergij Radonezhskij was said to carve wooden toys of different shapes and presented kids with them. At the end of the 19th century, Vasilij Zvezdochkin, the first Matrushka Doll artist carved the doll, dressed it into the apron, sarafan, and babushka. He called it “Matrushka”. Later many variations of Russian nesting dolls appeared, the painting became more diverse. There were various figures of Matrushka Dolls: girls, boys, bridegroom and bridesmaid, Saints, etc. The fantasy of Matryoshka’s artists wasn’t limited. No wonder that first religious nested dolls appeared in Sergiev Posad, too. This region was well-known not only for its toys, but also for its icon painters.